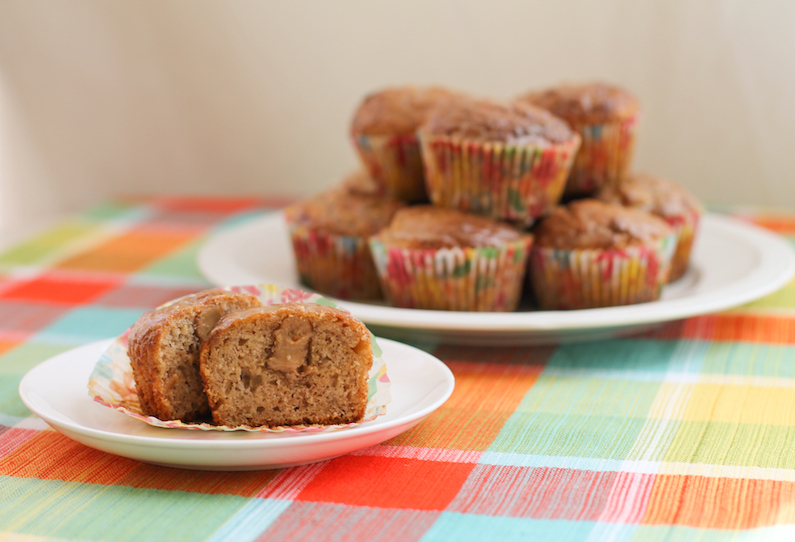 Peanut butter stuffed banana muffins are baked with our favorite banana batter filled with a good teaspoon of peanut butter each, then dipped in a sweet peanut butter glaze. 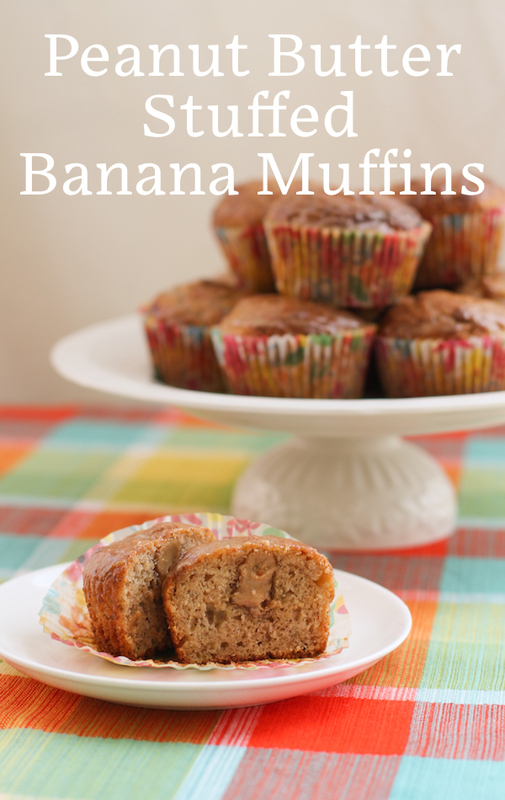 These guys are a special treat for breakfast, snack time or even dessert. Whenever I have bananas that are past their best, I can’t bear to waste them. My go-to recipe when my girls were still at home was banana cake, a light and fluffy after-school snack they both enjoyed. (Want something approaching muffins? 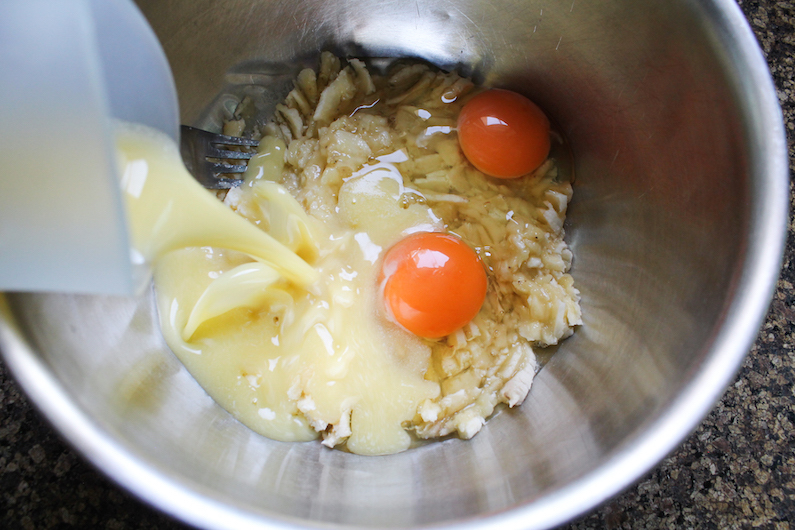 Bake the batter as cupcakes.) Nowadays I am more likely to mix up some muffins. 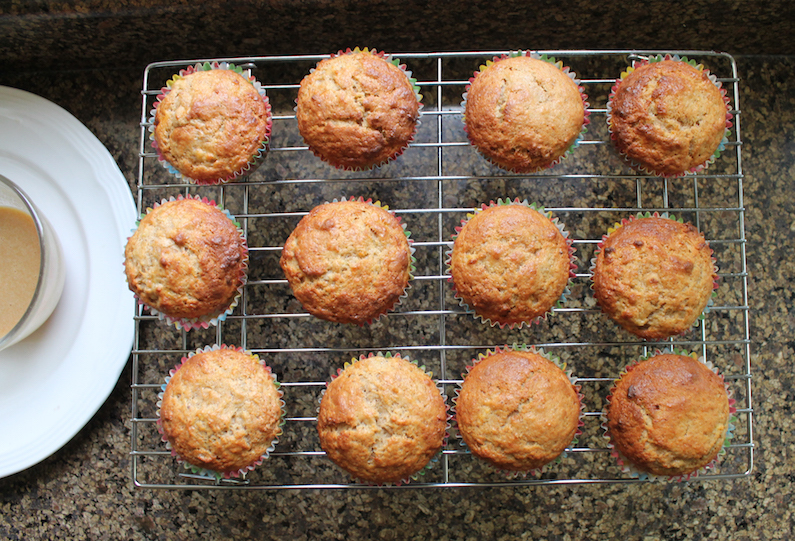 For this month’s Muffin Monday, I decided to kick those banana muffins up a notch or two with the addition of peanut butter, but not mixed into the batter since that might overpower the banana flavor. 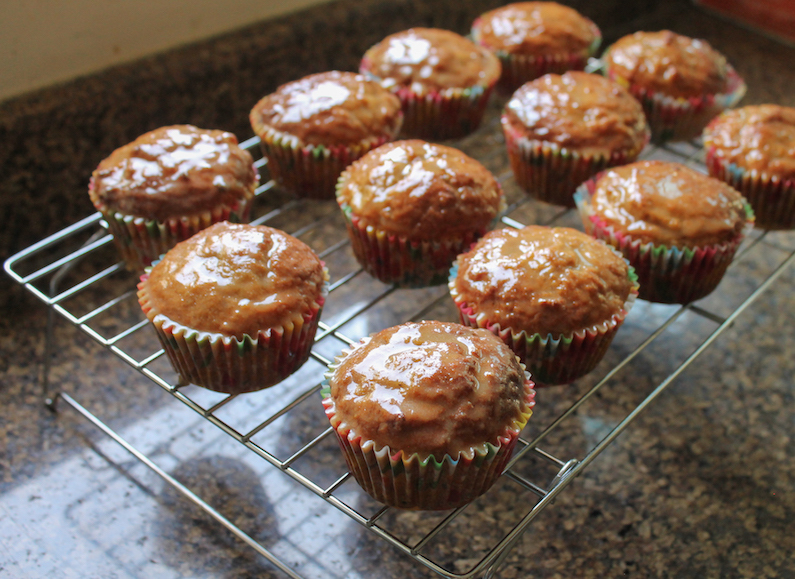 Instead I froze 12 teaspoons of peanut butter and tucked them in the batter, where they became a lovely soft surprise. 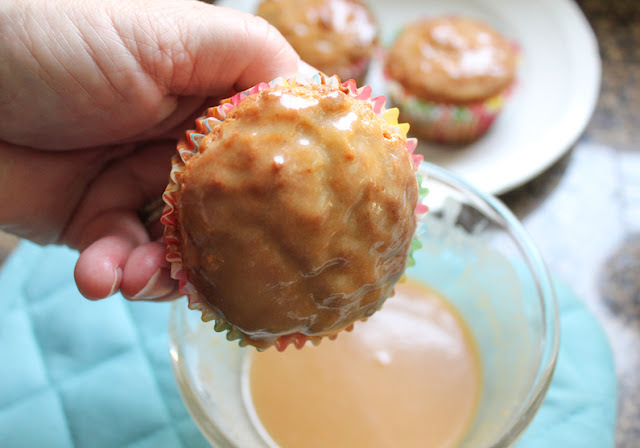 Make these muffins with or without the peanut butter stuffing or the peanut butter glaze for a simpler treat, but if you’ve got just a little extra time, I recommend you make all three. 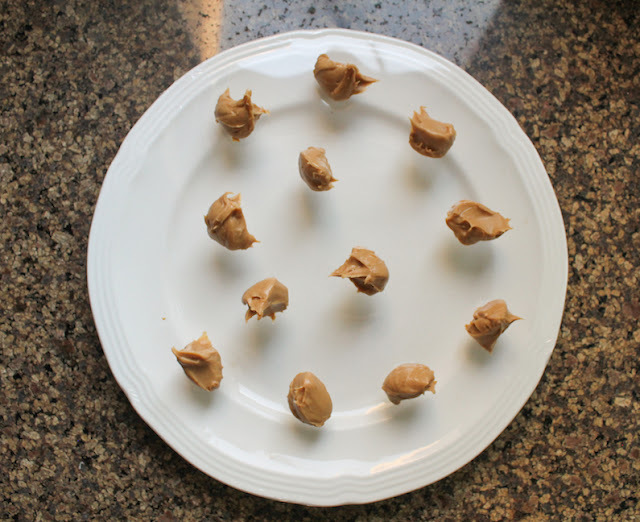 The peanut butter can be popped in the freezer the night before, if you are baking these for breakfast. Cover a plate with cling film or waxed paper and scoop out 12 teaspoons of peanut butter onto the prepared plate. Put the plate in the freezer until ready to bake, but for at least 30 minutes. The peanut butter never gets completely hard, even if left overnight but it does firm up nicely. When you are ready to bake, preheat your oven to 350°F or 180°C and prepare your 12-cup muffin pan by lining it with muffin papers. I also like to give the muffin papers a quick spray of nonstick cooking spray to help them release the muffins after baking. In a large mixing bowl, use a fork to mash your three very ripe bananas. Whisk in the butter, eggs and vanilla until thoroughly combined. 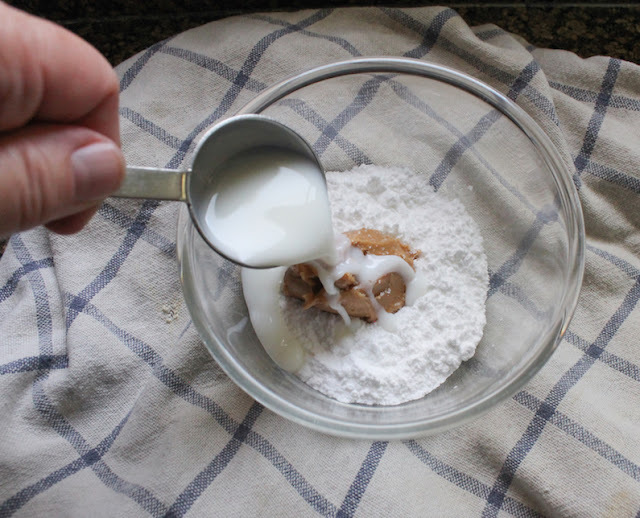 Pour the wet ingredients into the dry ingredient bowl and fold until just combined. Scoop a little more than half of the batter into the 12 muffin cups. 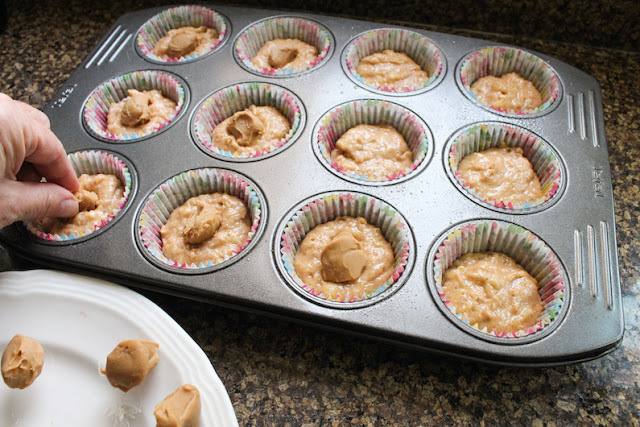 Remove the teaspoons of peanut butter from the freezer and poke one into each of the muffin cups. Top with the remaining banana batter making sure to cover the peanut butter completely. Bake for 20-25 minutes or until golden brown in the preheated oven. 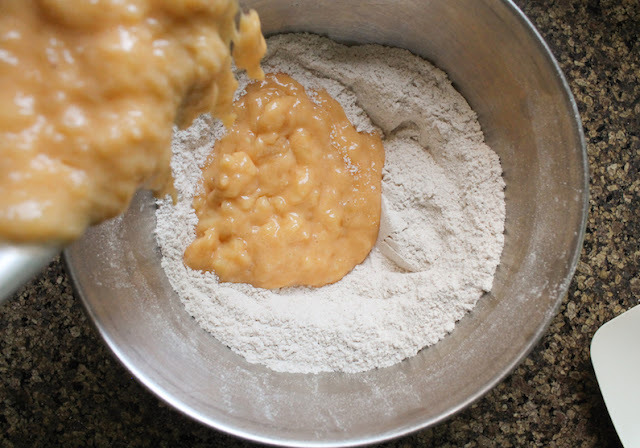 Meanwhile, make the peanut butter glaze by mixing all of the ingredients together in a small bowl. Remove the muffins from the oven and set them aside until they are cool enough to handle, then remove them from the baking pan and leave to cool completely on a wire rack. Once the peanut butter stuffed banana muffins are cool, dip the tops in the glaze. Set aside to dry. I had plenty of glaze so I actually dipped mine twice. Because more peanut butter is always a good thing. 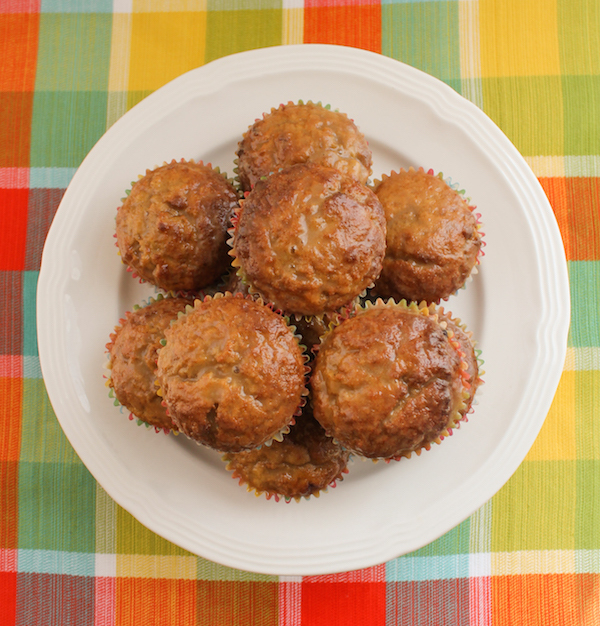 Check out all the other lovely muffins my Muffin Monday baking group is sharing today!